SCHOONER LIBERTY Launched in 1993 the 80 ft. Schooner LIBERTY is a steel hulled replica of early 1800's schooners used as cargo carrying vessels and by New England fishermen. LIBERTY is Coast Guard licensed to carry 49 passengers, which she does on a daily schedule in Key West, Florida year round. She is maintained in like new condition to meet the standards of our most discriminating clients. Schooner LIBERTY has been chartered by both NBC and ABC Television companies for the filming of television series and boasts and extremely impressive corporate client list. 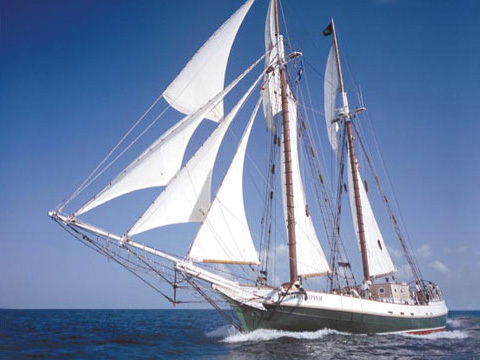 The Schooner LIBERTY is also available for private charter to corporations, families, and other groups for meetings, outings, client entertainment, weddings and other special events. SCHOONER LIBERTY CLIPPER The Schooner LIBERTY CLIPPER is also available for charter and your clients, employees and social guests will be impressed and delighted at the pageantry of sailing aboard a classic sailing vessel! Completed in 1983 the 125 ft. Schooner LIBERTY CLIPPER is a steel vessel that is a majestic replica of an 19th century clipper ship. LIBERTY CLIPPER is Coast Guard licensed to carry 115 passengers, which she does in Boston, MA in the summer and Key West, FL in the winter.